Here is how it works: we have books wrapped up so the title cannot be seen. 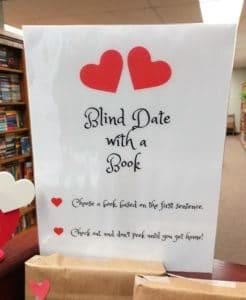 You will pick your ‘Blind Date’ by the ‘pick up line’ on the front. Take it home. 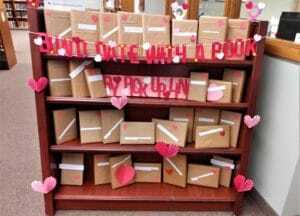 Have a cup of hot tea, coffee or your favorite beverage & then open the package to find out if the book will entice you to read the whole book or not. You may find an author you have not read, a subject matter never thought of trying or you may end up with a dud. Bring it back and try again.. No losers here. No drama and an enjoyable time had by all.